A surprise display of flower power! Siobhan Smyth recently completed a succesfully personal injury claim for a client of ours – a Mrs P from Luton. 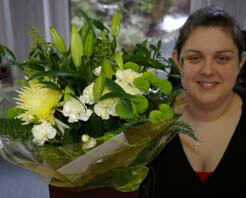 ‘Nothing unusual in that’ you may say, but Siobhan had a very fragrant surprise when this beautiful bouquet was delivered to our offices here in Northwich. Mrs P was so delighted with both the settlement and service she received from us that she felt compelled to send a floral thank you. Aah! This article was added on Tuesday, February 23rd, 2010 at 10:14 am and is categorised under General News. Both comments and pings are currently closed. Error: Error validating access token: Session has expired on Saturday, 09-Mar-19 13:12:58 PST. The current time is Wednesday, 24-Apr-19 20:02:18 PDT.